Last Thursday, the website of the London Daily Mail put online the incredible sonar-generated map of the half mile long chunk of the bottom of the North Atlantic where the Titanic came to rest, two and a half miles down, 100 years ago the 15th of this month. When one of the most popular and acclaimed books on the sinking, Walter Lord's "A Night to Remember," was published in 1955, it was not yet understood that the ship had broken in two while still partially on the surface. 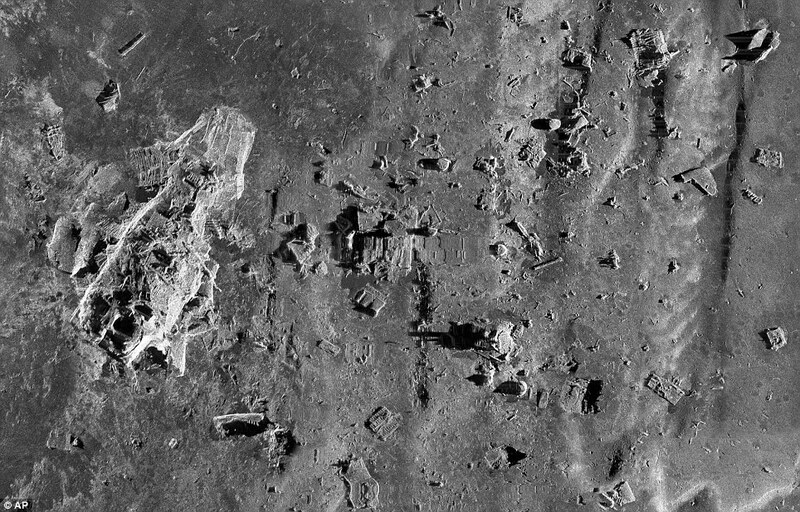 Speculation that it had in fact done so was confirmed by photographs from the famed discovery of the ship on the ocean floor by a Woods Hole, MA oceanographic team. 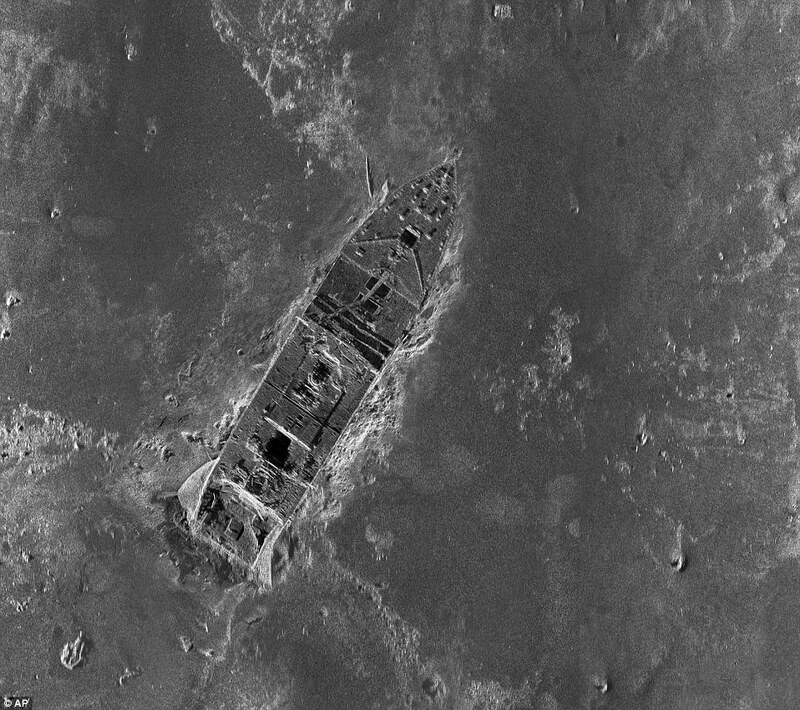 At the time, Dr. Robert Ballard, leader of the expedition, commented that the forward section of the ship had "landed" on the ocean floor but that the stern had "crashed," given the relative conditions of the two sections. 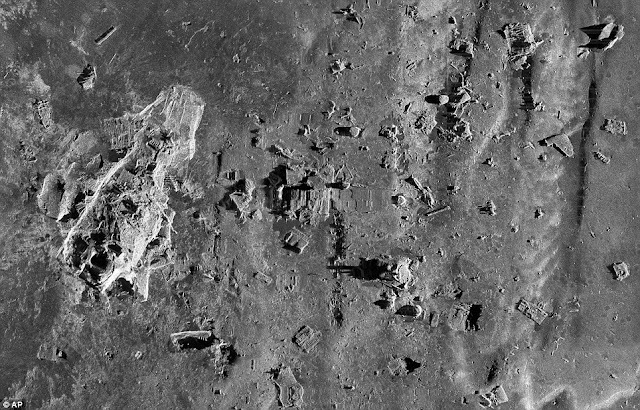 This full overview of the debris field shows clearly identifiable ship section top center, and a much less identifiable stern section in the lower left center with large chunks lying on the ocean floor from nearby to some distance away. There will be a two hour History Channel documentary on the hundredth anniversary during which the entire process of making what they're calling a map of the site will be explained in detail. Two robot underwater sonar vehicles scanned the debris field in a precise grid pattern, the sonar penetrating the pitch blackness and murk of the muddy bottom. 130,000 images were then assembled to make the picture above. Close-up of the bow and midships. It is this section that scraped along the iceberg, ripping open enough of the hull to allow seawater into five of the water-tight compartments into which the ship was divided. Water Lord reported that if only four had been compromised, the Titanic would probably have remained afloat. He also cacuated that if the order to swerve to avoid the iceberg had come several seconds sooner, the iceberg would have been avoided; if it had come several seconds later, then the ship would have struck head-on and smashed its bow but not have compromised more than the first water-tight compartment and would also have remained afloat (as when the U.S. liner Arizona hit a berg head-on in 1879, crushing 25 feet of its bow, but remaining safely afloat and able to be sailed into port). The Titanic was put out to the public as "the unsinkable ship." Lots of ships sink from the bow but don't break apart. 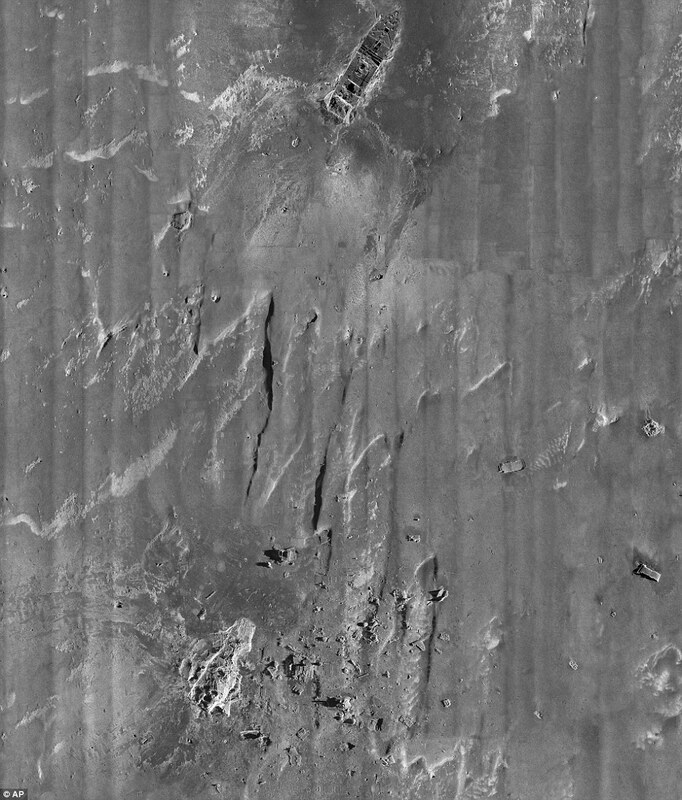 For many years there have been questions as to why Titanic split apart and others have wondered why the gash in its port side was so long. Some research has speculated the Harland and Wolff shipyard in Belfast, Ireland used inferior steel that became more brittle in the icy cold North Atlantic than superior steel would have, and shattered readily when impacted by the iceberg. Others have speculated that marine designer Thomas Andrews placed too many vast open areas, like dining rooms and grand salons, in one section of the ship, reducing strength due to an insufficient number of structural members in that part of the hull. 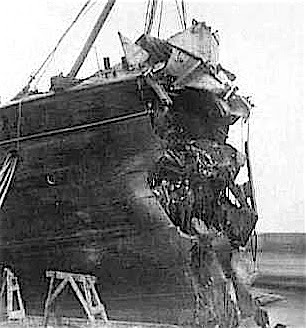 The mangled stern, embedded in the bottom silt, and major debris including engine boilers and shredded sections of the hull. Of course, the big scandal was the number of dead -- more than 1500 versus just over 700 saved -- linked to the fact that the Titanic carried an insufficient number of lifeboats for everyone on board. There is shared blame here, plenty to go around. British Board of Trade rules of the day did not require boats for more than a certain percentage of people on modern steamships. A major calamity was considered unlikely with the shipping lines so full of other ships that could come to the rescue, and because of the safety technology supposedly included in the ship's construction. In point of fact, the Titanic carried lifeboats in excess of Admiralty regulations, if still inadequate to the number of souls on board. British classism played a big role. When the order came down from the bridge to abandon ship, the entrances to the lowest passenger deck, the third class or steerage deck, were locked. Steerage was one of the big financial engines that made trans-Atlantic liners profitable. Large numbers of people, mostly immigrants looking for a better life in the United States, were crammed into Steerage. They were rigidly segregated from Second and especially from First Class, whose passengers would presumably be offended by the sight of them. When someone finally thought to open the gates and let them up to the boat deck, most of the boats were already gone. But the old Chivalric Code was also at fault. The rule for places in the lifeboats was "Women and Children First." But in firm belief of the much publicized unsinkability of the Titanic, and because getting into a small boat in the freezing North Atlantic in pitch blackness wasn't particularly appetizing, lots of women refused to go. And the men, particularly First Class men, were heavily invested in a belief system that they must go down with the ship rather than take places in the boats meant for women. So, with women not going in great numbers and men not going, many of the first boats were launched at half or less than half capacity. The crew, seemingly not able to enforce the Captain's abandon ship order, allowed the death toll to mount by not compelling people into the early boats. By the time it became obvious that catastrophe was at hand, and steerage passengers were finally released to find their way up to the boat deck, it was too late. Carnage on a huge scale was inevitable. A decade ago, Fritz and I drove around Nova Scotia and visited Fairview Lawn, the "Titanic cemetery" in Halifax. Over a thousand passengers and crew had died of hypothermia in the frigid water, their bodies borne up by the thick cork slabs in their life jackets. A few ships were dispatched to pick up the victims (one cable-laying ship found 306) but most other ships relied on reports of the shifting westward movement of the "zone of the floating dead" to avoid the area completely. Between those brought in by search ships and others who washed up on the Nova Scotia shoreline, Halifax provided a resting place for 150 Titanic dead at Fairview and two other cemeteries, while other remains were transported to relatives if their identity was known . But one man wasn't washed ashore, nor was he picked up floating in the icy North Atlantic. He didn't hang back to give his seat to a woman, nor did he join the men of his social class in the First Class Lounge for cigars, whiskey and comraderie while waiting to face the end with stiff upper lips like gentlemen. 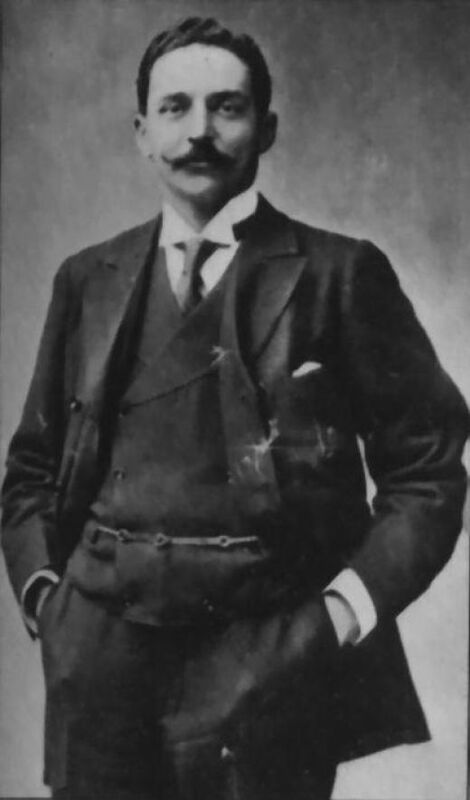 He was Bruce Ismay, Director of the White Star Line that owned and operated the Titanic. He simply climbed into one of the last boats and took a seat in it. About an hour later he turned away, unable to look as the stern section hung vertically for a few seconds against the star-filled sky and then plunged to the bottom in a futile search for its lost forward section. On the rescue ship, he isolated himself in the Doctor's cabin and subsisted on opiates for three days until the Carpathia docked in New York City. Bruce Ismay gave testimony at the Inquests held by the U.S. Senate and the British Board of Trade, being savaged for cowardice by the public and Press on both sides of the Atlantic. Accounts by eyewitnesses repeatedly suggested that he had urged Captain Smith to run the Titanic at top speed no matter what, ignoring or suppressing iceberg warnings from other ships. He resigned as head of the White Star Line a year after the disaster and went to ground in a country house in Ireland, trying to disappear as completely from pubic view as possible. He died in 1937. I must have read Walter Lord's book a half dozen times as a kid. The story and the way people behaved as the crisis developed fascinated me. There was an air of high Greek Tragedy about the event -- the largest and most luxurious ocean-going vessel ever built, arrogantly declared immune to the ever-present danger of the sea, had been struck down on its first voyage, taking with it some of the wealthiest and most powerful people in the world at that time. But there was one other part of the book that astonished; in the introduction, Lord revealed that fourteen years BEFORE the sinking of the Titanic, American author and inventor Morgan Andrew Robertson had written an eerily prescient novella. Here is a (slightly edited) section of the Wikipedia entry: "Morgan Andrew Robertson (September 30, 1861–March 24, 1915) was a well-known American author of short stories and novels. He is best known for his short novel "Futility," first published in 1898. This story features an enormous British passenger liner called the Titan which, deemed unsinkable, carries an insufficient number of lifeboats. On a voyage in the month of April, the Titan hits an iceberg and sinks in the North Atlantic, resulting in the loss of almost everyone on board, including the cream of international society. There are some strong similarities to the real-life sinking of the RMS Titanic." A very interesting post! I visited the Titanic exhibit at Maritime Museum of the Atlantic in Halifax last September with my daughter. It was very poignant.... especially the personal effects and details of the passengers who died. Fascinating. And those sonar images are amazing. Truly fascinating, albeit tragic, event.